Hong Kong Tower slot has a futuristic design and despite the title isn't a traditional Oriental-themed slot, but instead focuses on the modern skyscraper metropolis of Hong Kong. The reels spin with futuristic sounds and the sound of the wind and distant rumble of traffic you would hear from the top of one of these high rise buildings. The reels have neon symbols and are transparent over the uniform pattern of windows of the skyscraper in the background. So can we have equally high expectations? We begin with the usual format of 3 rows over 5 reels but with a large number of pay lines - 99 in fact, for which 100 coins are necessary for a spin. The highest paying symbol is not the Wild, for in this instance there aren't any but that is not an issue as we will find out. Instead they are the 7's paying 15x bet for 5-of-a-kind and appear singly. 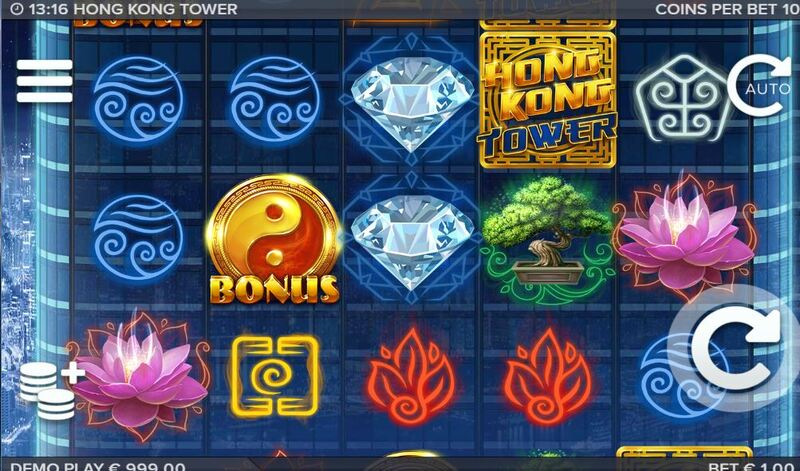 The rest of the icons appear stacked though and are the diamonds at 10x bet, the Lotus flowers at 5x and the Bonsai tree at 2x. The remaining symbols aren't card icons but graphic representations of Earth, Wind, Fire, Life and Water all paying 0.8x stake for the 5. 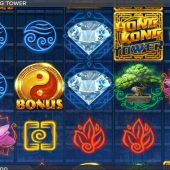 The remaining symbols are the bonus scatter which appears on all reels as does the stacked Hong Kong Tower mystery icon. The stacked Tower symbols will transform where they appear into any other icon, including the bonus, but only if it can form a win. For example you get matching symbols on reels 1 and 3 and the Tower appears on reel 2 then it will rotate and may or may not stop on the one you require. You can get a full screen as such so if they were to be diamonds you would earn 990x bet and if they were sevens, a sky-scraping 1485x bet! Who needs Wilds? You can land 3, 4 or 5 red bonus scatters to trigger the Wheel feature, but can also get them via the Tower Mystery symbols as described above. Three scatters lets you spin the first of the 3 prize wheels once, 4 or 5 let you do this but with 1 and 2 extra lives respectively. If you reveal a blue bonus scatter under the Tower Mystery symbol, it will count as 5 standard red bonus scatters and award 2 extra lives. You are then faced with 3 skyscrapers each with neon bonus wheel on top. This reminded me somewhat of IGT's Wheel of Fortune Triple Extreme and similar slots, but this is far better I found. The first wheel has prizes from 2-20x bet, and an arrow to move to the next higher-values wheel. Any award you win will go dark and end the bonus should you land on it again, although it will pay the award a second time. The second wheel has prizes from 5-100x bet plus the arrow. The final 'big wheel' has prizes from 20-500x bet but no arrow. The maximum win though is capped at a staggering 301,650 coins or 3165x bet! When you land on an unlit segment and/or have run out of lives, the round ends.